The upcoming Power Rangers movie isn't so much an adaptation of the beloved '90s property, as something that's sorta-kinda influenced by it. A bit. Everything we've seen of it so far suggests it's definitely its own creation. The Rangers' suits are more in line with something cooked up by Tony Stark, the trailer makes the film look like Chronicle-lite and the villains? Well, they're barely recognisable. That looks like it's about to take someone's eye out. Perhaps this falls more in line with a darker, moodier approach to the material. Could we be in for a more mature (see: bloody, violent) Power Rangers movie? Mature or not, the biggest hurdle the film has to overcome is Repulsa's drastic look. 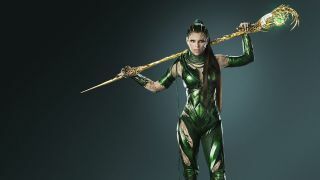 Much has been written about Elizabeth Banks' take on Rita Repulsa. Based on her appearance, the character shares nothing in common with the earlier version. While Banks says it's a "modern and edgy makeover", that's the sort of thing someone (probably) said during early Terminator Genisys pitch meetings. They may as well have created a brand spankin' new baddie, no? Directed by Dean Israelite and starring Naomi Scott, Dacre Montgomery, RJ Cyler, Ludi Lin, and Elizabeth Banks, the Power Rangers movie will be released in UK and US cinemas on March 24, 2017.